PORTLAND -- The Cony girls lacrosse team admittedly didn't know much about Cheverus, its opponent in the Eastern A title game Wednesday at Fitzpatrick Stadium. 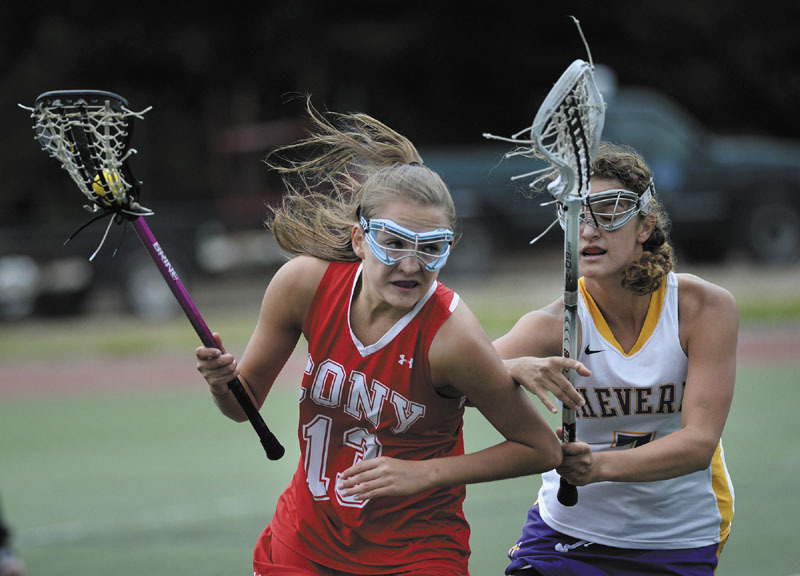 PORTLAND — The Cony girls lacrosse team admittedly didn’t know much about Cheverus, its opponent in the Eastern A title game Wednesday at Fitzpatrick Stadium. The Rams know more than enough about the Stags now. Senior captain Elyse Caiazzo turned in a dominant performance, scoring a game-high six goals, as No. 2 Cheverus beat No. 4 Cony 16-6 to reach its first state final in program history. Alex Logan scored three goals while Meredith Willard, Staci Swallow and MaryKate Walsh each added a pair for Cheverus (12-3), which dominated the game from the opening draw. Josie Lee had three goals while Hayley Quirion added a pair for Cony (11-4). Bayleigh Logan also scored for the Rams, who were out-shot 26-11. The Stags (15-2) jumped on the Rams from the get-go, scoring three goals in the first eight minutes. Caiazzo had a hand in all three of them. She came out of the left corner and roofed a shot past Cony goalie Izzy Eames to open the scoring about four minutes in. Caiazzo assisted on the next two Cheverus goals, which came about two minutes apart. The latter, which gave the Stags a 3-0 lead, came on a nice pass from behind the Cony net to Logan, who quickly fired a shot past Eames with 17 minutes, 50 seconds left in the half. “We had our cutters working,” Caiazzo said. After Caiazzo scored on a direct shot nearly three minutes later to give Cheverus a 4-0 lead, Livingston called a timeout to settle her team. Caiazzo slammed home a rebound off her own shot with 14:53 left and Willard made it 6-0 nearly three minutes later when she sprinted down the left side, cut to the middle and beat Eames with high shot to the far post. Cony finally broke through when Lee and Quirion scored 32 seconds apart later in the first half. However, the Stags out-scored the Rams 7-1 to close the half and grab a commanding 12-3 lead. The Rams would get no closer. Eames finished with 10 saves while Cheverus goalie Hope Correia had five.